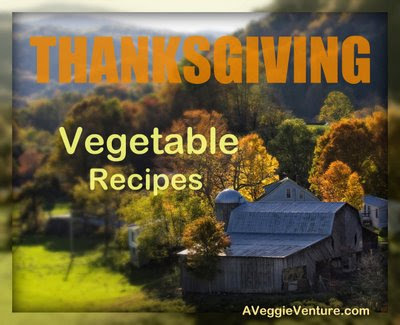 For anyone hunting Thanksgiving vegetable ideas, welcome! These recipes were selected especially for Thanksgiving, so perfect and so delicious, there's real potential to upstage that ol' turkey and his dressing. The 2006 - 2008 collections of Thanksgiving vegetable recipes were hugely popular, especially what became 2006's famous World's Best Green Bean Casserole and 2007's surprise favorite, the low-carb Cauliflower Cream and my personal favorite in 2008, Creamy Brussels Sprouts Gratin. I love every single one of these Thanksgiving vegetable recipes and truly hope they inspire your own Thanksgiving gathering! In 2009, I'm also featuring six completely different Thanksgiving menus over at Kitchen Parade, my food column. Whether you're planning a traditional Thanksgiving, a casual buffet, an entirely make-ahead Thanksgiving, a vegetarian Thanksgiving, even a lower-calorie Thanksgiving, there's a menu to inspire. I kicked off the series with a great basic recipe for Roast Turkey and then added my grandmother's sausage stuffing recipe and light 'n' fluffy homemade whole wheat rolls. Enjoy! 'Featured recipes' are ones published 2006 - 2009 especially for Thanksgiving. That Brussels Sprouts Gratins looks amazing, a must try! I stumbled upon this site while searching for 'Thanksgiving Dishes that Travel Well'. The family we are visiting do not believe in vegetables, so I love bringing awesome dishes that we love and surprising them with how delicious veggies can be. I bookmarked 4 recipes from your page and had to stop there so I did not overburden myself with choices! I cannot wait to try them; I may make before hand and have hubby choose which he likes best! Thank you for the awesome veggie recipes! Jessica ~ So glad you “stumbled” in, really! It thrills me to hear your reaction, I do so love Thanksgiving for its vegetables and yes, the collection has gotten big! Be sure to check out the full collection (it’s updated with new recipes every year), I’d share the link but the comment system won’t let me but rest assured it’s at the top of this post, so easy to find.